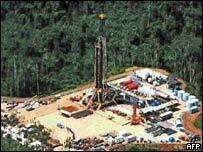 The release of 71 hostages who were kidnapped near a gas pipeline under construction in southern Peru marks the return of rebel activity to the country's rural areas. 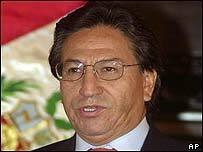 Peruvian President Alejandro Toledo said the "remnants of the Sendero Luminoso" were behind the attack. If so, it was the biggest attack by the group, known in English as the Shining Path, for at least a decade. When all the hostages were freed unhurt, it was a welcome piece of good news for President Toledo, who has come under severe pressure from strikes in recent weeks. But now a revamped Shining Path could cause more headaches for the president. In its heyday in the 1980s, the Shining Path was the most formidable rebel movement in Latin America, waging a war against the state which left an estimated 30,000 dead. Not only did the rebels win control of large areas of the countryside, but they also struck repeatedly at targets in the capital, Lima, giving rise to fears the group would eventually succeed in taking over the country. 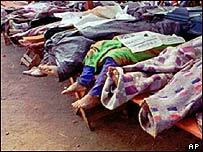 After a series of high-profile attacks, the worst single incident came in July 1992, when two car bombs went off in the middle-class district of Miraflores, killing 20 people and injuring more than 250 others. 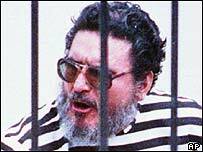 Yet just two months later, the Shining Path leader Abimael Guzman was captured in Lima along with six other rebel leaders. He was tried by a military court behind closed doors and sentenced to life imprisonment, and this dealt a decisive blow to the movement. He is due back in court after a retrial was ordered earlier this year. In Guzman's absence, and despite his subsequent call for a ceasefire, Oscar Ramirez Durand spearheaded an underground resurgence of the movement in the mid-1990s. Ramirez, alias Feliciano, could only count on the backing of a few hundred rebels, compared to the several thousand who had belonged to the organisation a few years earlier. This rump faction of the Shining Path was largely confined to coca-producing regions in eastern Peru and no longer had the power to undermine the foundations of the state. But in 1999, Ramirez was also captured, leading to hopes that the rebel movement might be condemned to total oblivion after seven years of increasingly limited activity. Some observers suggested that the threat of Shining Path insurgency was kept alive principally by then President Alberto Fujimori, to boost his political profile. President Fujimori had ordered the storming of the Japanese embassy in Lima after it was seized by another militant group, Tupac Amaru, in December 1996. Taking a tough line against unrest played well for President Fujimori. But in November 2000 he fled the country in the wake of a corruption scandal involving his spy chief Vladimiro Montesinos. His departure paved the way for Alejandro Toledo to win power in 2001, after an earlier defeat by Mr Fujimori in elections which were widely seen as fraudulent. But now President Toledo may have to deal with the rebels in his turn. Under Guzman, the Shining Path was a ruthless organisation, killing villagers whom it said sided with the government as part of a plan to create a new social order. It controlled many areas of the countryside, and had an active membership of up to 10,000. But by 1994, about 6,000 guerrillas had surrendered under a government amnesty programme. However, although it is probably only a few thousand strong, the Shining Path still has local power bases in several rural areas of Peru. The group's focus now seems to be on local coca farmers - defending them against possible government intervention. President Toledo's government has not taken the kind of direct action seen in neighbouring Bolivia, where the army were sent in to destroy coca fields. The United States is backing anti-coca campaigns in a number of Latin American countries to try to control the cocaine trade. But analysts say that after the disgrace of the final Fujimori years, President Toledo may have more room for procrastination because he inevitably looks good by contrast with his predecessor. "If he comes under pressure, Toledo covers himself in the flag of democracy," says John Crabtree, a researcher at St Anthony's College, Oxford. Faced with strikes by teachers, farmers and health workers, President Toledo has more pressing problems in the cities than in rural areas. The main opposition party (Apra) "doesn't want to bring the government down" before the end of Mr Toledo's term in 2005, according to John Crabtree. And the United States may be more lenient with the president than with some neighbouring leaders, even though it is not happy with his record against drug cultivation so far. This may all allow the Shining Path more freedom to continue building up their strength in the countryside. But are the rebels now turning to new methods? If the kidnapping was indeed carried out by the Shining Path, it would be the first time that they have sought to raise money with ransom demands. So far, the 20 armed rebels involved in the latest operation have evaded capture. And the key question is whether such incidents are repeated. "Toledo could have nipped it in the bud, and then the kidnapping could have proved a window of opportunity for him," says John Crabtree. But if the Shining Path launches more attacks, the Peruvian president could be facing a new and more militant challenge to add to his other woes.